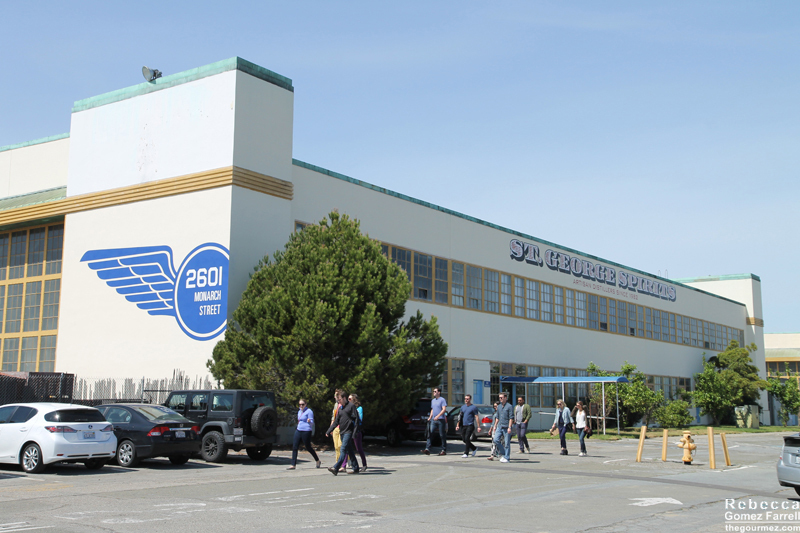 Since I moved to the Bay Area two years ago, I’ve heard countless admonitions that I hadn’t been to St. George Spirits (2601 Monarch St., Alameda Point), one of the first craft distilleries in the US. 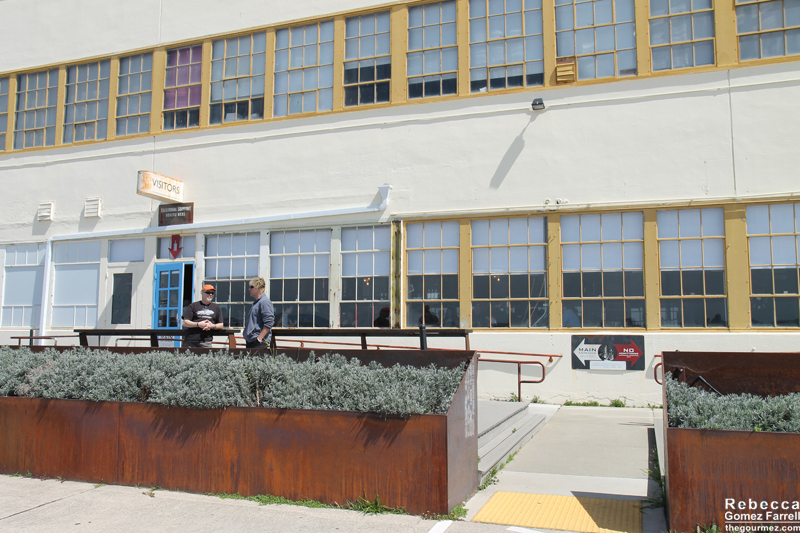 Even more recently, that’s shifted to countless admonitions to check out Faction Brewing, housed next door, as beer appeals more broadly than liquor as a rule. But it doesn’t to me, and as both Alameda-based facilities share the same lovely view of San Francisco, marred only by a chain link fence, I made St. George my priority. Only a year ago, St. George offered tastings of the Hangar One line of vodkas in addition to its current spirits menu, but it sold the brand and production has moved to the Faction Brewing building instead. 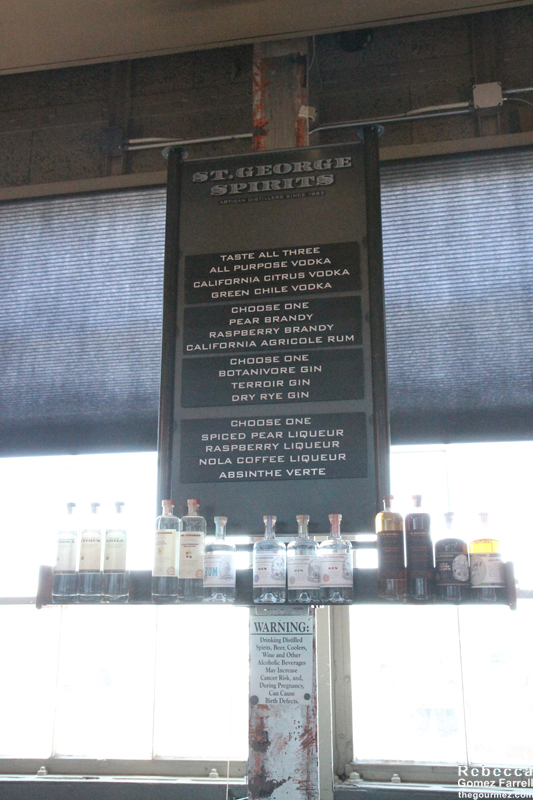 Never fear, St. George has plenty of great options under its own label! 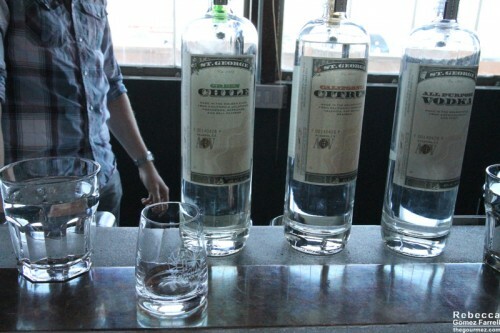 –tasting spirits is a world apart from tasting wine. Do not stick your nose in that glass unless you want to burn some hairs. Instead, swirl a little and then smell the air just above the glass. Then roll small sips of it over your tongue in small doses. Vodkas first! Of these, the green chile was definitely my favorite. It didn’t have as piquant a flavor as other spicy spirits on the market. Instead, the chiles tasted roasted with a bit of sweetness to them. They aren’t roasted, but something about the combination of jalapenos, lime, serranos, jalapenos, cilantro, and bell peppers gave off that impression. All those ingredients make it quite unique but also restrained. The citrus was likewise mild in pungency, using valencia and seville oranges and bergamot. Both flavored options are appealing for cocktails. For the rum and brandy set, I chose pear brandy and my husband chose the raspberry. Neither of us was that impressed with our selections. They hold plenty of fruit flavor but don’t have any characteristics that stood out. That is not the case for St. George’s gins at all. 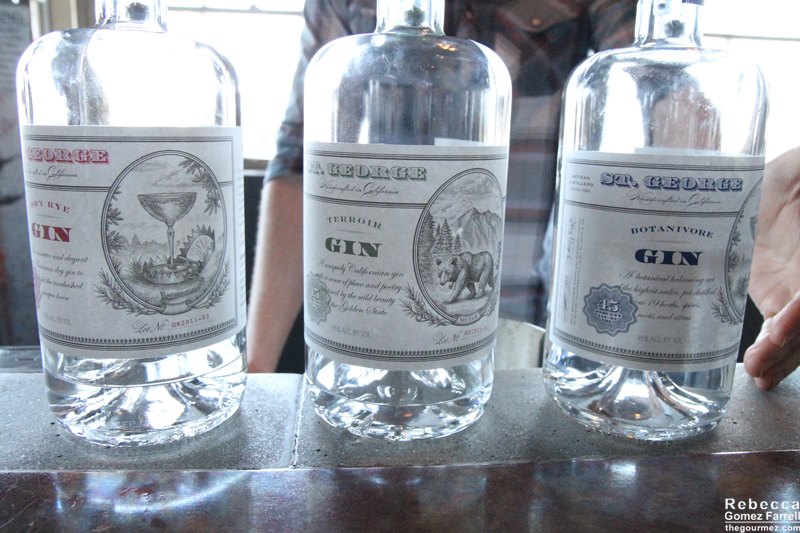 The Terroir gin is the standout, and no surprise, since it has the most terroir of any of St. George’s offerings. It approximates ingredients found on Mt. Tam, the Bay Area’s tallest peak. I have tasted nothing else that captures the experience of a morning foggy hike through Northern Californian woods so well. The eucalyptus, the soft bay laurel, and refreshing coriander evoke that mood and make this a gin I can actually enjoy. 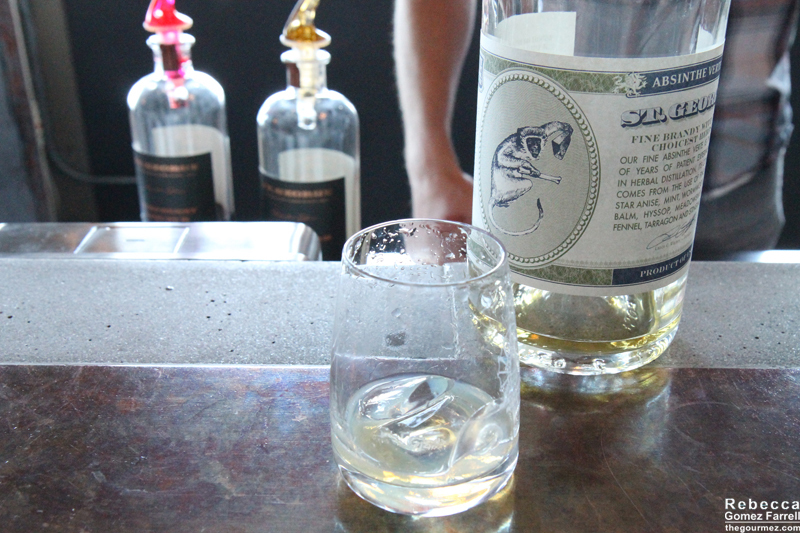 We also tried the Botanivore, which more closely approximates a typical, spicier, and more strongly juniper gin. It does that well, but typical gins are not up my alley. Of the final group, we chose the NOLA coffee liqueur and the absinthe verte. It’s no secret that I adore absinthe. St. George’s was the first released in the US after absinthe was legalized and it boasts a fun story about its label origins that I’ll let the spirit guides tell you in person. The absinthe was good, but it lacked memorable qualities for me. I found softness a plus for St. George’s flavored vodkas and Terroir gin, but it failed the absinthe, which needs to assert its personality more strongly. Or maybe I just need to drink more than a taste. Probably that. 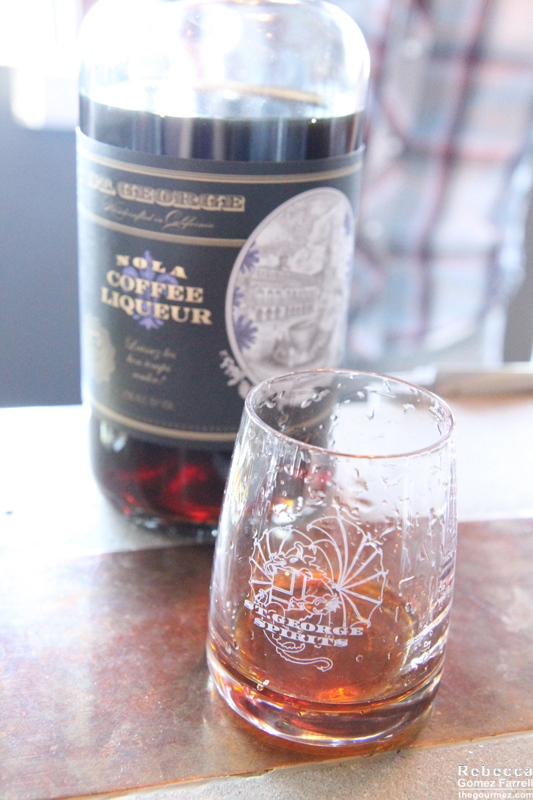 The coffee liqueur had no problem catching my attention. Made with chicory root, Yirgacheffe coffee beans, and Madagascar vanilla, this liqueur will easily replace the cloyingly sweet Kahlua and Tia Maria in my alcohol stand. The woodsy and earthy characteristics of its ingredients shine through. 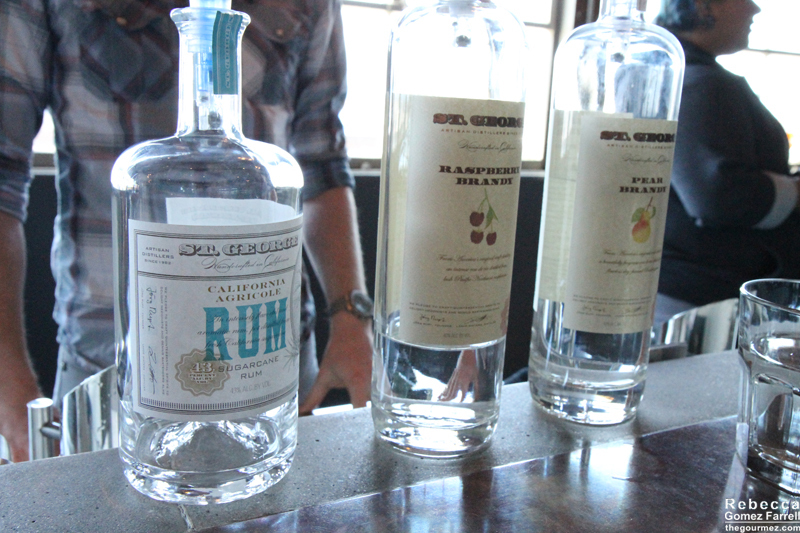 I enjoyed trying St. George’s wares, and I think they show a distinctive philosophy, aiming for spirits and liqueurs that provide unique flavor profiles while demonstrating restraint. For an additional $5, you can take a tour of the distillery, but I’ve taken enough distillery tours to last a lifetime, so I passed on that. 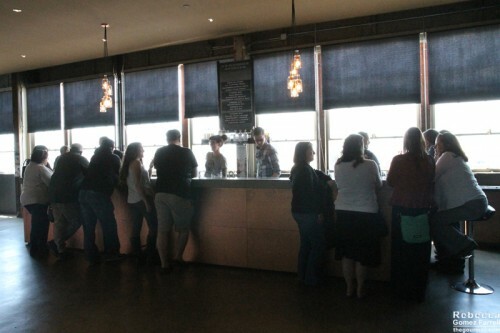 Tastings begin every half hour on the weekends and tours on the hour. We had no wait at 2 pm on a Saturday in April, but that’s not usually the case. For a large group, plan ahead and make a reservation on their website. The deck in front of the tasting room is also a picturesque spot for a picnic before or after your tasting. Awesome, Kevin, thanks for sharing that! My husband is a drone hobbyist currently, too, and he’d love to work his way up to photography sometime.